For those of you who are super observant, this is a no-brainer. When you read an article on a website or anything on the internet, do you evaluate what you have read ranging in its accuracy, reliability, and value. Or do you just take whatever you have read as TRUTH as you trust the source and therefore you have no reason to question its source and providence. LORD RAYELS WEBSITE ra-EL.org has been online since May 2011. 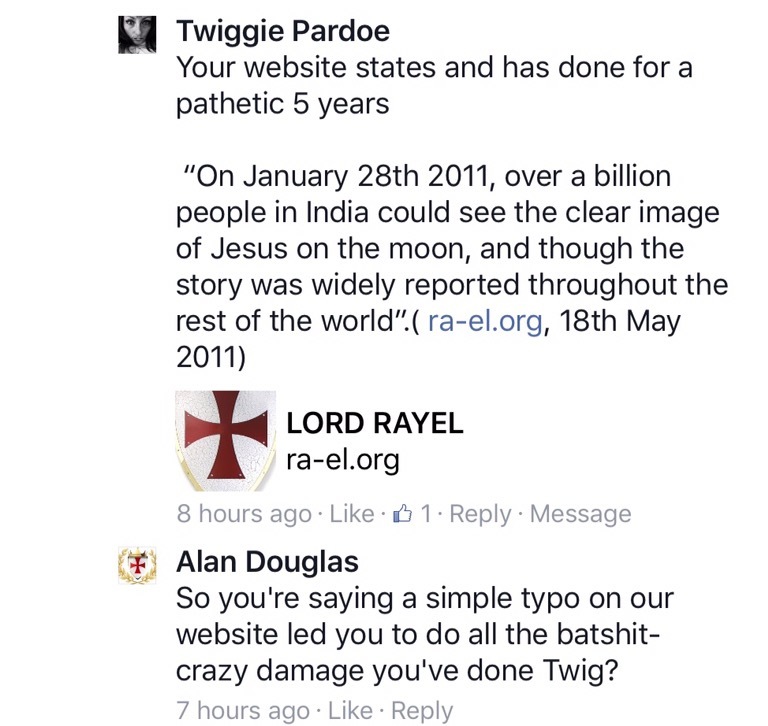 Over the years it has recruited Clergy who have come and gone and ‘Imperial Regent’ Alan Douglas will boast that they have thousands of followers, all whom you would think have visited the website and read the Evidence Section. According to the website entry 18th May 2011, RayEL, Ra-el is the incarnated Jesus, the prophesied Messiah and a sign foretelling this was first seen on the Moon. According to the Holy & Apostolic Order of the Temple this was a divine sign and they used scripture from the Bible to legitimise this claim. The use of scripture is often cherry picked and distortedly misrepresented to back up ‘prophecies’ and this is a continued theme throughout the Lie that Raymond Howard-Lear is the Returned Christ. In fact this passage “And then shall appear the sign of the Son of man in heaven: and then shall all the tribes of the earth mourn, and they shall see the Son of man coming in the clouds of heaven with power and great glory” Matthew 24:30 is in fact after the great tribulation where the sun will be darkened and the moon will not give its light. This passage can be cross referenced with Daniel 7:13. “In my vision at night I looked, and there before me was one like a son of man, coming with the clouds of heaven. He approached the Ancient of Days and was led into his presence”. This is totally fabricated. 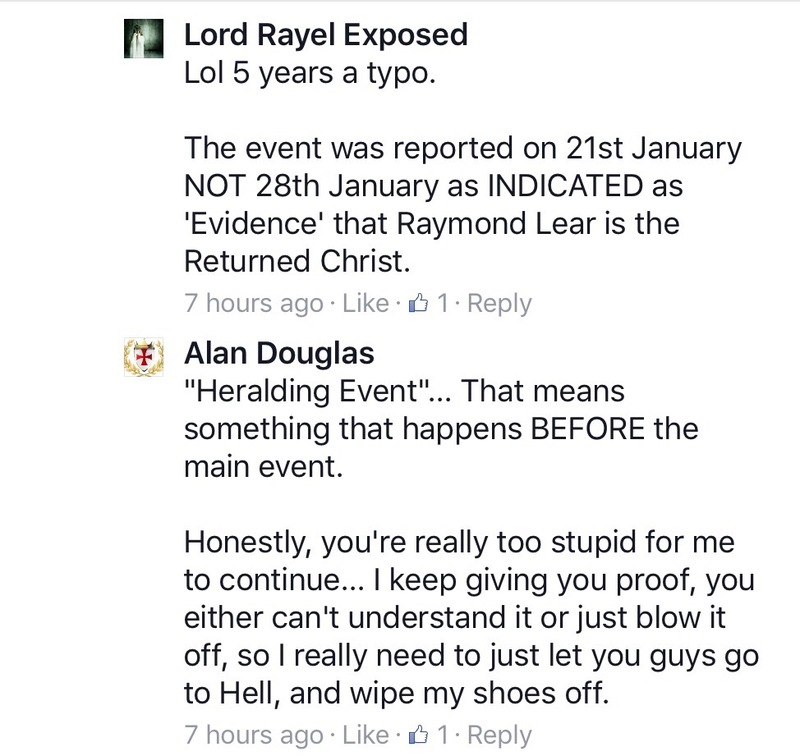 The event was reported on 20th/21st January NOT 28th January as INDICATED as ‘Evidence‘ that Raymond Lear is the Returned Christ. WHILST researching this claim, I also looked for other articles regarding this event. 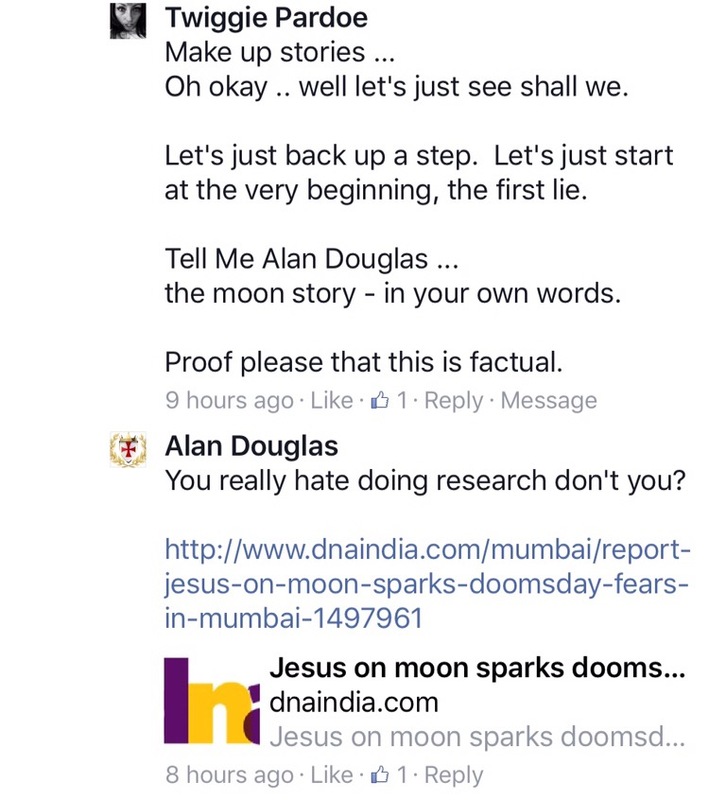 News that Matters – Goa Citizens Fear Virgin “Mary” on the moon. All of the above articles STATE categorically that the event witnessed was seen on 20/21st January 2011 Not 28th. A conspiracy theorist could argue that this was a part Stage 2 of Project Bluebeam to implement the new age religion with the antichrist at its head. That the moon imagery was a three-dimensional optical hologram was used, as part of the gigantic ‘space- show’. Scientists, however, explained the images as the result of the sun’s light falling on the undulating surface of the moon. FROM THE VERY OUTSET THE HOC AND EOC LIED ABOUT THIS EVENT. THEIR WEBSITE HAS INCLUDED THIS FALSE INFORMATION SINCE 2011. On 14th October 2016, the writer had the opportunity to ask ‘Imperial Regent’ Alan Douglas formerly known as Angelus Domini about this event. This is a copy of that transcript. So …. 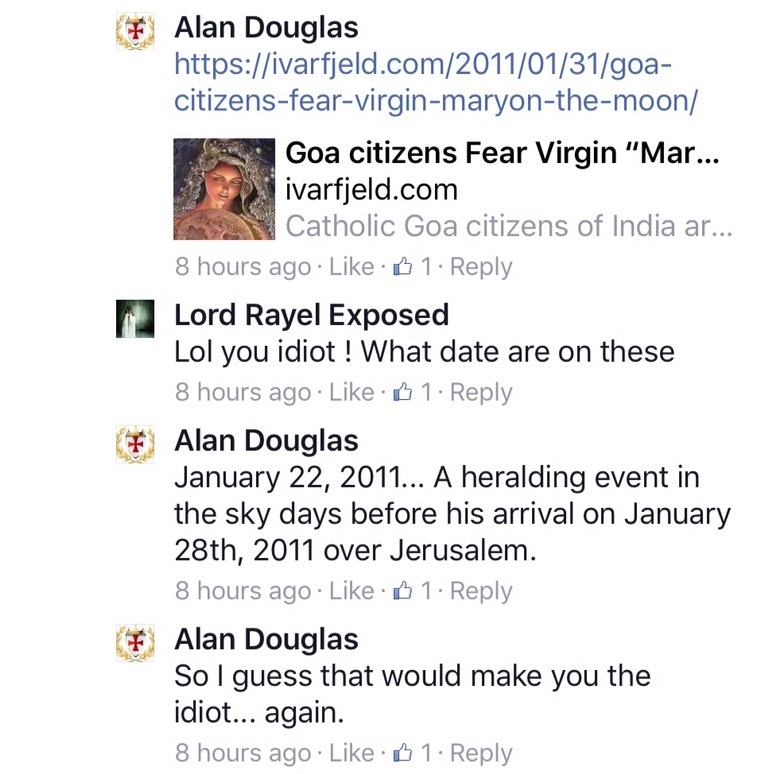 first Alan Douglas gives a date of 22nd January and then states it’s a typo. As you can see from the evidence that I have presented here, the event did not occur on the 22nd. What is rather astonishing is that in 6 years nobody has questioned this. That would be Clergy too. There is a lot of high quality information available through the Internet. Unfortunately, however, there is also a large amount of misinformation, this Raymond Lear being the Returned Christ falls neatly into the latter. Remember that a Web site that makes up facts, quotes people who don’t exist, and cites imaginary sources could look just as professional and slick as a highly reliable and credible site but in actual fact is deceiving you. This is the first of many lies that have been uncovered surrounding the tale of Raymond Elwood Howard Lear being ‘Jesus’. This elaborate story was superseded in 2012 with even more of a bizarre story ‘The Jerusalem UFO EVENT’. According to the website entry 18th May 2011, RayEL, Ra-el is the incarnated Jesus, the prophesied Messiah and was first seen on the Moon.